the LORD with the shout of a trumpet. 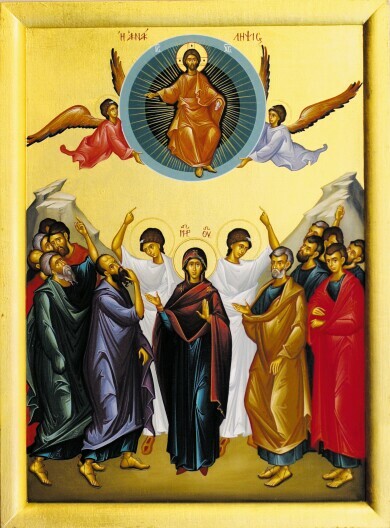 I am convinced that words are inadequate to describe some Biblical events, and that the Ascension is among these. Something happened, but I am not certain it was a literal ascension. I believe, however, that, when it (whatever it was) was over, Jesus no longer physically present on the Earth. In fiction and non-fiction narratives the teacher or mentor must exit before the students can come into their own. Obi-Wan Kenobi had to die before Luke Skywalker could become a Jedi Knight in the original Star Wars trilogy. And, in real life, Jesus had to leave the Earth before the Apostles could become leaders of the Christian movement and the figures we read about in Acts. Yet the Apostles were not alone; in about a week and a half they would receive the Holy Spirit, to which we have access today. Jesus is present with us, although not in the historical sense. Historical Jesus left the stage almost 2000 years ago. Yet the Christ of faith has been with Christians for nearly two millennia. And we have a call to be Jesus to each other. I have had this experience when I have needed it the most. You might have known divine love in this form, also. So, Jesus is still with us. Thanks be to God! Do you not know that a little yeast leavens the whole batch of dough? Clean out the old yeast that you may be a new batch, as you really are unleavened. For our paschal lamb, Christ, has been sacrificed. Therefore, let us celebrate the festival, not with the old yeast, the yeast of malice and evil, but with the unleavened bread of sincerity and truth. Nowon that same day, the first day of the week, two of the disciples were going to a village called Emmaus, about seven miles from Jerusalem, and talking with each other about all these things that had happened. While they were talking and discussing, Jesus himself came near and went with them, but their eyes were kept from recognizing him. And he said to them, “What are you discussing with each other while you walk along?” They stood still, looking sad. Then one of them, whose name was Cleopas, answered him, “Are you the only stranger in Jerusalem who does not know the things that have taken place there in these days?” He asked them, “What things?” They replied, “The things about Jesus of Nazareth, who was a prophet mighty in deed and word before God and all the people, and how our chief priests and leaders handed him over to be condemned to death and crucified him. But we had hoped that he was the one to redeem Israel. Yes, and besides all this, it is now the third day since these things took place. Moreover, some women of our group astounded us. They were at the tomb early this morning, and when they did not find his body there, they came back and told us that they had indeed seen a vision of angels who said that he was alive. Some of those who were with us went to the tomb and found it just as the women had said; but they did not see him.” Then he said to them, “Oh, how foolish you are, and how slow of heart to believe all that the prophets have declared! Was it not necessary that the Messiah should suffer these things and then enter into his glory?” Then beginning with Moses and all the prophets, he interpreted to them the things about himself in all the scriptures. AlmightyGod, who through your only-begotten Son Jesus Christ overcame death and opened to us the gate of everlasting life: Grant that we, who celebrate with joy the day of the Lord’s resurrection, may be raised from the death of sin by your life-giving Spirit; through Jesus Christ our Lord, who lives and reigns with you and the Holy Spirit, one God, now and for ever. Amen. Both services for Easter Sunday contain Gospel readings which tell of followers of Jesus encountering him and not recognizing him until he said or did something which revealed his identity. I propose that one reason (if not the reason) people did not recognize Jesus was that they did not expect to see him, for they thought he was dead. When they realized that he was alive, however, they told the eleven surviving Apostles and those gathered with them. Imagine how traumatized the followers of Jesus in and around Jerusalem must have been. The Roman Empire had just executed Jesus via a method meant to make an example of him. Might they be next? Then God acted and restored Jesus to life. This was wonderful news indeed. Who, upon encountering the resurrected Jesus, would not feel encouraged and compelled to tell others? 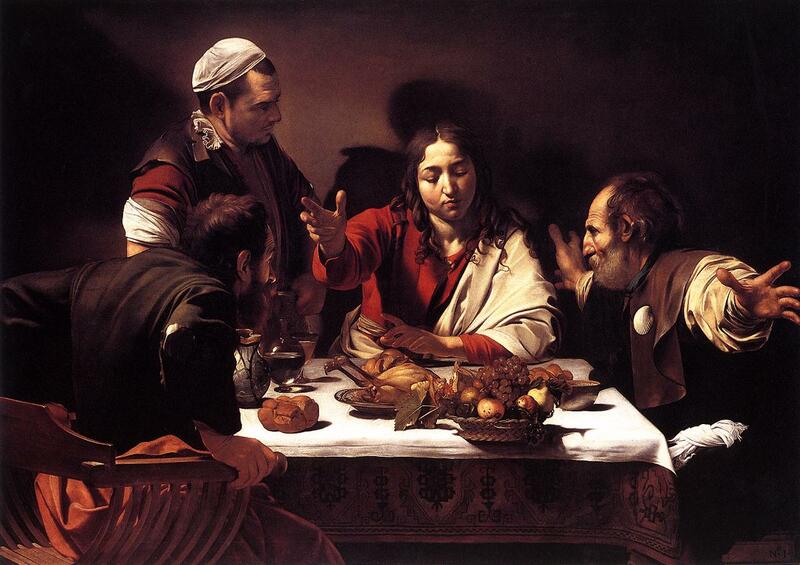 Ask yourself: Where, in our daily lives, are we on a walk to Emmaus? When does God act powerfully in our proximity and encourage us, and we do not recognize the divine action? May we open our spiritual eyes and understand what God has done and is doing, and act according to what that demands of us.